Lord knows we don't get enough dystopian prison movies these days, mush less ones starring Christopher Lambert! 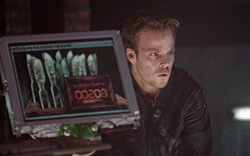 Thank God Fortress rectifies that oversight, with Lambert imprisoned in a high-tech underground complex -- all for the crime of trying to have a second child with his wife (Locklin)! Of course, she's also incarcerated, and the evil Kurtwood Smith (our favorite dad from Dead Poets Society) torments them both. Tepid sci-fi fare that is, nonetheless, not completely painful to watch. It says "H.P. Lovecraft's" above the title, but rest assured, the grand master of the weird tale never wrote a book by the name of Bride of Re-Animator. This update/retelling of the Frankenstein story is every bit as cheesy as the original tale, but much of the geeky humor that made the original Re-Animator such a classic is sorely lacking here. The film is just a continuation of the story of Herbert West (Jeffrey Combs) as he works on his green serum that can reanimate dead tissue. Naturally, as the body count rises, it shrinks in lockstep. The heady and fabulously gruesome works of H.P. Lovecraft have lent the plotlines to more than 20 movies, and most of these films are unbearable direct-to-video shlock. But 1985's cult classic Re-Animator launched this return to Lovecraft's work, and if later filmmakers had learned anything from Stuart Gordon and Brian Yuzna's horror masterpiece, they would have assured old H.P. a much stronger legacy. Ghostbusters meets Twin Peaks? Michael J. Fox's comeback movie? A film about a lazy guy who catches ghosts for a living? A supporting cast of unknowns? Does anyone want to see a movie like this? Yes! And you'd better get to the theater quick, because The Frighteners, in a manner suggested be the above questions, will not make huge waves at the box office in a crowded field of summer blockbusters. Quite an assembly of talent is ultimately wasted in this near-pointless look at a mental patient (that guy from the TV remake of Jason and the Argonauts) who thinks he's Hitler. A bunch of his fellow patients seem to think they're members of his staff, too. Essentially this is a re-imagining of Marat/Sade, adding in a head shrink (that guy from one of the Star Trek shows) who may be crazy too. Hitler's psychosis (the real Hitler, I mean) has been examined with substantially more depth and to a more powerful effect numerous times before.